Founded in 2014, Southern Vintage Photography has been offering wedding, family, and commercial photography services inspired by the southern culture of Charleston. We are continuously looking for fun brides, grooms, families, and local businesses searching for a memorable experience and quality images. If you are a lover of the crisp, light and airy, romantic scenes of Charleston, we might be a match! 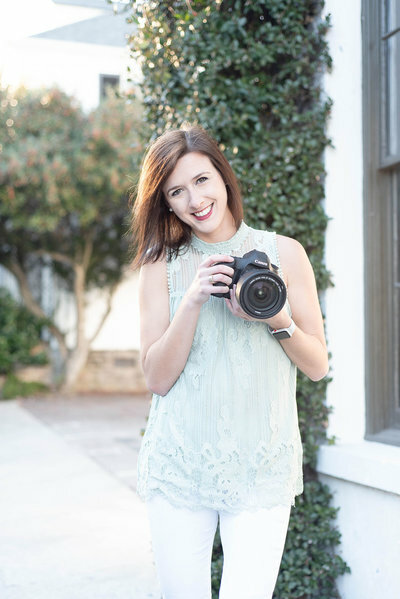 Meet our team and find out more about our creative professionals capturing the Lowcountry! offering elegant and timeless photography for weddings, families, and businesses in the lowcountry. Growing up in Georgia, I knew that the South was where I’d end up calling home. Everything from the flowers, to the historic downtowns and plantations, I was sold! I have a degree in visual journalism and specialized in photography, graphic design, and art history. Where possibly could I apply these types of creative skills?! Safe to say, Charleston had me at the window boxes! When I am not taking photos, or thinking about taking photos.... I am spending time outside, exploring Charleston with friends, or running along some road training for a race. I'm a bit of a foodie, a big pro football fan, and probably the most organized creative mind you'll meet! 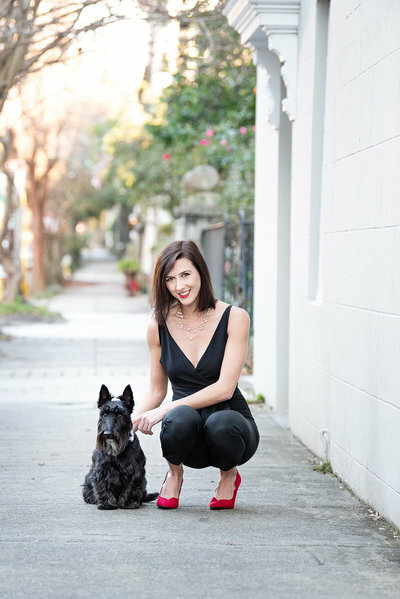 "I love a good cup a coffee, my scottish terrier, and a long run so I can enjoy charleston's fabulous food scene!" Born and raised in the Mid-West, Celess has always been a dreamer of hot summer days and salty-ocean air! Jacqueline and Celess founded Southern Vintage Photography together as new friends after moving to Charleston. While her family recently made the move to Greenville, SC; Celess is still a contributing talent to SVP! Looking for a photographer upstate? Let us know! This Pennsylvania native has been an artist since childhood. Her extensive retail and luxury real estate experience provides her an acute sense of detail when it comes to photography and styling. Caroline is a Penn State grad and has an adorable pup named Wyatt! When she isn't doing her creative thing with SVP, you can find her surfing at Folly Beach, traveling, or enjoying the Charleston music scene! Charleston is the definition of "southern vintage." This Lowcountry staple is the direct inspiration of what our photography is all about. We strive to capture organic smiles and memories among this beautiful place we call home. Where do we begin with our wonderful weddings? If you are a creative, organized, in-the-moment couple, we are YOUR wedding photographers! Our goal is to provide an excellent photography experience and final product to cherish for years to come. We also offer photography for engagements, bridals, and intimate weddings as well! Please email us for more information and tell us all about your special day! Life goes by too fast to not slow things down with a great photo. We are here to capture every beautiful milestone from newborns, high school seniors, and everything in between! Let us be the photographers you trust and come back to for all your portrait needs. The Holy City is growing by the minute and so is the business and professional scene. Now, more than ever, is a great time to stand out from the rest with high quality images that leave a lasting impression. See how our photo team can take your brand to the next level! We are here to provide marketable images for every Charleston professional! commercial photography: inquire about our hourly rates!